“Why is this a movie?” That question pops into my head roughly 15 minutes into most documentaries these days. Non-fiction films have been overrun in recent years by visually undistinguished, fundamentally expository pseudo-films that amount to little more than illustrated magazine articles. (Inexplicably acclaimed examples: Enron: The Smartest Guys In The Room, No End In Sight, An Inconvenient Truth.) That question has never occurred to me during an Errol Morris film, however. Morris thinks in pictures. He’s a filmmaker first and foremost—just one who happens to make documentaries. And when I first saw his third feature, The Thin Blue Line, back in 1988, it forever changed the way I looked at and thought about onscreen non-fiction. Previously, and unconsciously, I think I’d held docs to a much lower standard, imagining that “truth” somehow trumped aesthetics. No more. Forget for a moment that we’re talking about a documentary. There are more memorable images in this six-minute sequence than most narrative films can muster. The initial shot alone, with the Burger King sign partially reflected at the bottom of the patrol car’s windshield, and only the officers’ torsos visible (with pools of light shining on their ID badges), demonstrates how the perfect composition can encapsulate an entire scenario in a matter of seconds. Likewise, Morris manages to establish a sense of menace simply by positioning the light behind the actor playing the doomed cop and allowing his long, long shadow to precede him en route to death. When the partner fires her pistol at the fleeing suspect, she precisely bisects the police car, with the headlights framing her chest and the rotating red beacons framing her head. Every shot is gratifying for its own sake, even as it serves as evidence in the case Morris wants to build. And the editing is equally dynamic. Morris depicts the murder in a series of beautifully arranged staccato bursts, with the gun firing from three radically different angles and the cop first spinning wildly to the left, then falling headlong to the right. Magnificent. Morris also takes a keen interest in objects, luxuriating in their tactile presence. The most arresting example in this sequence, certainly, is the you-are-getting-sleepy pocket watch used to represent hypnosis, which I seem to recall having a starring role in Miramax’s trailer. 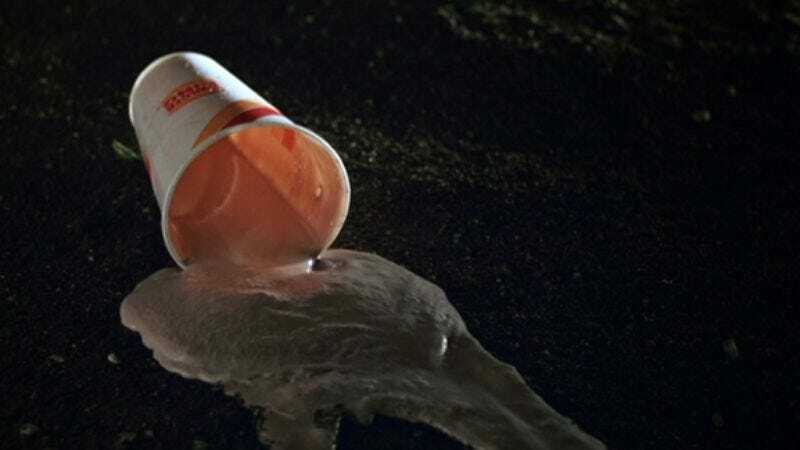 But my personal favorite is the flying Burger King milkshake (or “malt,” as the Texas cop calls it, though he apparently thought they were stopped at a Whataburger). You can easily imagine Morris poring over the police reports and getting distracted by the notation “choc. liquid” at the crime scene; while it does have a bearing on the case (tending to suggest that the partner wasn’t paying full attention), that didn’t really necessitate a shot of the cup sailing through the air, or an extended close-up of its contents spilling onto the road. But it does lend the question of her competence an offbeat, pathetic poignancy—just as the other cop’s death is rendered even sadder by the image of his handcuffs clinking together as the murderer fires one last parting shot. Even the shots of newspaper text treat the words as objects with a definable weight and presence, rather than mere information. Morris is also endlessly fascinated with people. His technique of allowing folks to hang themselves with their own rope (which animates the entirety of 1999’s Mr. Death: The Rise And Fall Of Fred A. Leuchter, Jr.) doesn’t surface until later in the movie, but it’s interesting to see him already striving to achieve a unique rapport with his on-camera interview subjects. Years later, Morris invented the Interrotron, a two-way device that allows people to stare directly into the lens while looking at the director, enabling something like a normal conversation. But even here, he has one of the two Dallas cops he interviews looking pretty much dead at us while still seeming to maintain eye contact with a human being—I can only assume that Morris had his head pressed right against the camera. (The beefier, Brian Dennehy-looking cop is at more of an angle, looking slightly camera-left, but he’s still closer to facing forward than most interview subjects.) Whether or not it’s due to such niceties of positioning, Morris consistently has the most relaxed, fascinating talking heads the doc world has ever seen. The main cop here could be telling Morris this story in a bar. If I could sit down for a drink with Morris, I’d ask him whether he still has any lingering interest in trying his hand at a narrative feature. His only attempt to date, made immediately after the relative success of The Thin Blue Line, was an adaptation of Tony Hillerman’s The Dark Wind, which was ignored by audiences and summarily dismissed by critics. I’ve never seen it, and I imagine it probably isn’t very good; Morris has admitted that his reasons for making it amounted to “vanity and greed.” And it’s entirely possible that he simply has no facility with actors, or quickly becomes bored by the strictures of a three-act narrative. But those aren’t insurmountable hurdles, and I find it impossible to believe that a filmmaker with an eye as remarkable as his couldn’t knock a genre picture out of the park if he put his mind to it. (For starters, I’d recommend he not adapt a novel.) Not that there’s anything wrong with documentaries, or that he somehow needs to prove himself by crossing over. But when I watch a sequence like this, I wonder what he might accomplish if he were unmoored from everything save for his boundless visual imagination.